On August 23, 2016, the citizens of Vestavia Hills turned out in record numbers to support the candidates of their choice. Approximately 6,500 votes were cast over six precincts, which represents a 39% turnout, compared to a 9% turnout in the previous 2012 municipal election. By comparison, in 2012, fewer than 2000 votes were cast. Highest voter increases were shown in Cahaba Heights (274% increase), Liberty Park (273% increase), Vestavia Hills United Methodist Church (253% increase) and Town Village (189% increase). The city also had a higher number of absentee ballots than ordinary (174). “The central theme of my campaign was to increase transparency, accountability and community engagement. I look forward to working with our council team to take a fresh look at how we can make our city better for all citizens. I believe government is smarter when it involves more people. I am honored so many in our city supported me in my campaign, and I look forward to earning their respect and trust. Strengthen your VOICE. from Kimberly Cook on Vimeo. 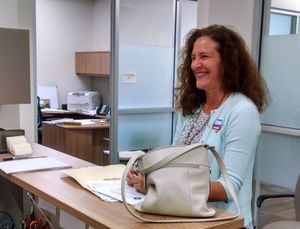 Tuesday, July 5, 2016, Kimberly Cook filed her qualification papers as a candidate for Seat 2, Vestavia Hills City Council. Qualification ends at 5pm on July 19. The municipal election will be August 23. Cook said, "I look forward to taking my message to the voters. 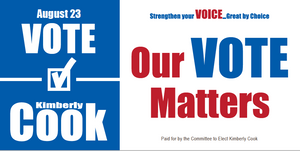 I cannot emphasize enough how important it is to vote on August 23 if you want your voice to be heard." To register to vote, check your polling place and see precinct open and close times, go to alabamavotes.gov. Upon receipt and verification of the application, the Absentee Manager, Rebecca Leavings, will mail the ballot and instructions to the address on the application. Follow the instructions for completing the ballot and mail to the address provided. 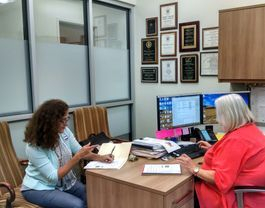 According to Rebecca Leavings, Election Official for the City of Vestavia Hills, absentee ballots must each be mailed in an individual envelope, one ballot per envelope, directly to the address provided in the instructions. If ballots are hand-delivered, they must be delivered to the Absentee Manager's office in City Hall, by the voter himself/herself. Family members or friends may not hand-deliver ballots for others. On May 12, 2016, Kimberly Cook filed papers for the formation of her campaign committee for Vestavia Hills City Council. Members of her committee are Chris Blazer (campaign manager), Gil Simmons (treasurer), Deloye Burrell, Scott Smithson and Celia Anthony. Kimberly indicated that her intent is to qualify for Place 2, the seat being vacated by Councilor Jim Sharp, who has served in that capacity for sixteen years. Kimberly is a long-time resident of Vestavia Hills. 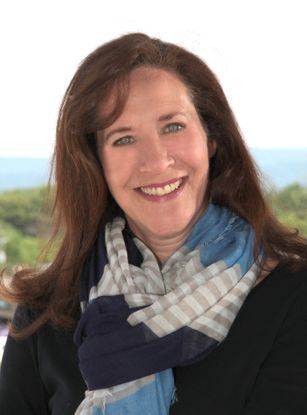 Shortly before moving to Vestavia Hills in 2002, she resigned her job as a senior systems engineer with SouthTrust Data Services so she could devote more time to her family and community volunteerism. 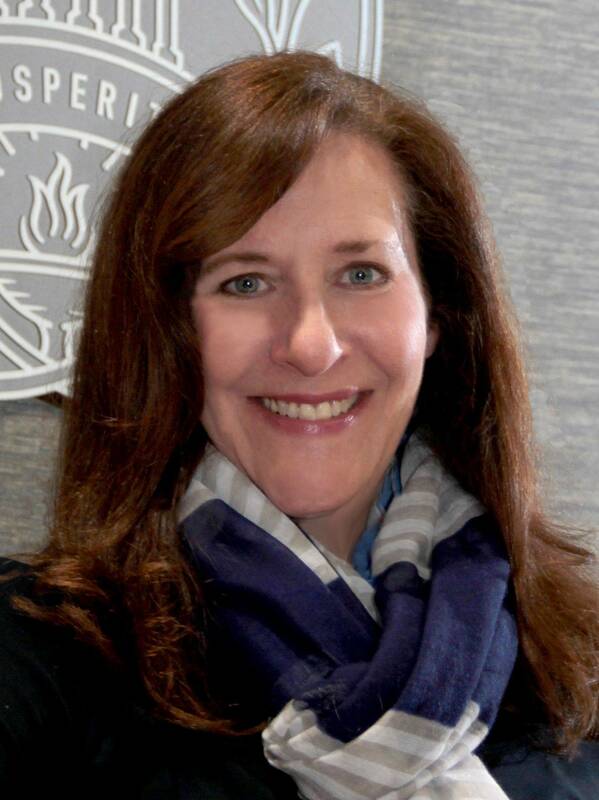 She is a commissioner for the Vulcan District Boy Scouts, membership chairman for the Vulcan District Committee, and is an active leader in her son’s Liberty Park Boy Scout troop. Kimberly also serves as secretary of the Brother Bryan Mission Board. She is active in her church, having taught youth Sunday School for over 20 years at Dawson Family of Faith. In her many years as a PTO mom, she has served in a variety of PTO positions at four schools. 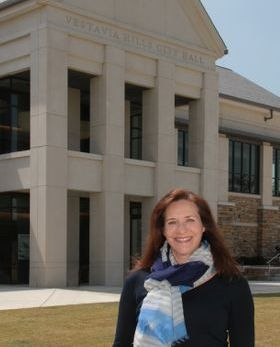 Kimberly stated she looks forward to talking with Vestavia Hills residents and businesses to better understand their concerns: "I believe including the collective voice of our community in the decisions that shape our future allows city government to arrive at smart solutions. I enjoy untangling a problem and providing clarity." Kimberly’s husband, Greg, is a partner in the law firm of Balch & Bingham, LLP. Greg serves on the Executive Committee for the Jefferson County Republican Party and is a deacon at Dawson Family of Faith. Kimberly has two children who have graduated from Vestavia Hills High School--Geoffrey, Class of 2010, and Mary Catherine, Class of 2014. Her son, Will, is currently a freshman and member of the Rebel Marching Band. Geoffrey, a graduate of the University of Alabama, lives in Washington, D.C., where he is employed as a software developer. Mary Catherine is a junior at Vanderbilt University, studying political science in preparation for law school.